Does anybody have a clue what this is related to? The last time they pulled something similar was in solidarity with Supreme Court ruling on gay marriage. 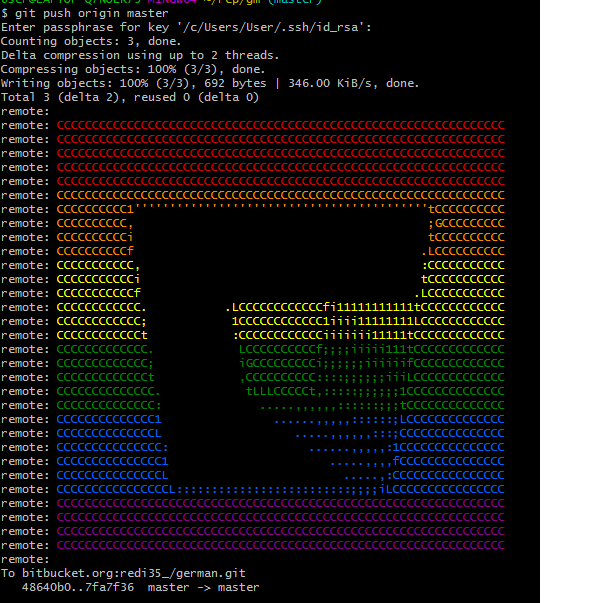 Note that this is not a duplicate of Atlassian “logo” after pushing to bitbucket, since that one was in celebration of the Supreme Court ruling on gay marriage. This one is in celebration of the LGBT pride month, June. According to Wikipedia, June is the LGBT pride month. Judging from the color scheme, it's probably a similar display of solidarity. Not the answer you're looking for? Browse other questions tagged git bitbucket git-bash or ask your own question. Why did git (bash) insert a bunch of nonsense into my new files? Why vendor folder's size drops from 100MB to 15MB after pushing it to bitbucket git repository? Bitbucket: what is the best way to update a pull request?